Global Warming, which influence in a greater presence of pests throughout the year, in shorter biological cycles, and in the displacement of pests to areas where the climate previously prevented their development. Transnational trade transports pests to new areas, now with temperatures where they can develop, and where they have no natural enemies to control them. These transboundary pests cause serious damage to crops because in general they are not properly identified and there is no habitual knowledge about their management and control. The current and predominant agricultural production system, that uses chemical insecticides repeatedly, usually causes the development of pest resistance to insecticides. Chemical treatments are usually carried out without considering the stage of development of the pest, nor the conditions of the crop and in many cases without a real risk. Chemical treatments of a preventive nature are simply carried out, and according to calendar dates. Unnecessary applications imply unnecessary contamination, to the environment and to the crops themselves. Current legislation tends to demand the sustainable use of phytosanitary products, by reducing their risks and their effects on human health and the environment. The same legislation encourages the use of integrated pest management techniques, and alternative approaches or techniques to chemical methods. In addition, there is currently scientific evidence on the effects of chemical insecticides on the environment and on the health of agricultural workers, such as recent studies on their harmful effect on pollinators, or the development of diseases in applicators who do not adequately use the protection equipment. The reality is that most of the chemical treatments carried out are unnecessary, inefficient, and late in a 30% of cases. In order to solve this problem the agricultural producer needs to take more efficient decisions, more information about the real state of the biological development of the pest and the real risk of the disease. A system of information and prediction of pests and diseases such as FuturCrop allows the agricultural producer to assist in making decisions to carry out treatments against agricultural pests only when they are necessary. In order to be efficient in pest management, the agricultural producer nowadays has systems that allows him to make efficient decisions for the management of plant pests and diseases. These systems allow to optimize and minimize the number of phytosanitary treatments, maintaining a level of control over pests and diseases superior to the one obtained at present. The parameters used to determine the risk and the best possible moment to carry out the phytosanitary treatment are basically climatic, the type of pest or disease, and those related to the type of host. The availability of this information allows to determine exactly when it is necessary to sample or perform a treatment. The use of these information models for decision making in the management of pests and diseases allows a considerable reduction in the number of applications with phytosanitary products, compared with the treatments carried out per calendar. And it is possible to get a reduction of chemical insecticides that can range between 30% and 50%. Because it provides information that allows efficient decision making. Because it allows to carry out the treatments only when necessary. Because many pests are vectors of viral diseases. So, by efficiently controlling the pest, the risk of crops suffering from the disease is greatly reduced. Because certain pests, characterized by outburst of population that are uncontrollable, can be easily controlled in the larval stages of their first generations. Because crops can be protected in their most critical growth states. Because the quality of the product is improved by reducing the number of chemical treatments, and therefore reducing the amount of chemical residues in crops, especially fruits and vegetables. Because nowadays farmers have fewer products to perform treatments, and at the same time they have the need to apply fewer treatments due to economic and legislative reasons. In Spain, Royal Decree 1311/2012, of 14 September, which establishes the framework for action to achieve sustainable use of plant protection products (which follows the guidelines of the Regulation of Parliament and Council No. 1107/2009, and Directive 2009/128 / CE) establishes that the treatments have to be registered in a field notebook, and economically and ecologically justified. The automatic modeling of the phenological state, the registration of the thermal integral that affects the development of the pests, the prediction of the biological development of the pest and the determination of the date of change of the biological stage of the pest, or of the risk of the disease , constitutes the adequate justification for the treatment. The register of monitoring, damage and treatments, and the corresponding reports facilitate traceability. Unlike other support systems in pest management decisions, FuturCrop does not need the installation of a weather station, and the process of capturing and analyzing data is fully automated. FuturCrop sends warning messages when the adequate circumstances occur for the development of the pest, and the biological moment in which it is found, thus increasing both the effectiveness of monitoring and treatment. In addition, the computer application allows to predict the moment for the pest next biological event. For the proper functioning of the disease models, the system needs leaf moisture data, being compatible with any model of meteorological station or sensor. With this information FuturCrop establishes the risk levels of the disease, allowing preventive actions. The use of new information technologies facilitate the sustainable development of agricultural production. In this sense, FuturCrop has been designed to provide an affordable and reliable support software for decision making in the management of pests and diseases, which can be used by both large landowners and small agricultural producers, so that the information that provides contributes to the effectiveness of monitoring, the consequent cost savings, and significantly reduce the risk of loss of harvest. The effect of chemical insecticides against pests, and also against their natural predators, and the simplification of the agricultural landscape, indiscriminately eliminating weeds, the native flora and shrub as a reservoir of useful fauna, are some of the main causes of the problem of the current proliferation of pests in the Agriculture. Agriculture considered as an industrial process of food production, which increases production at the lowest cost and accelerates processes through chemical products, has caused serious environmental problems for years. Among other things, this production system favors the cleaning of fields of bushes, hedges, trees and shrubs. But this practice supposes the reduction of biodiversity in the agricultural landscapes and the elimination of the proper habitats of the native species of predators and parasites of plagues, and causes therefore a greater vulnerability of the crops to pests and diseases. This intensification in agricultural production creates a high pressure of pests and diseases on crops, which is usually controlled with chemicals insecticides. However, numerous investigations show that the indiscriminate use of agricultural insecticides causes damage to the environment, to the farmer´s health, and to the consumer himself through chemical residues in the crops. Knowing the damages that these products can cause, the usual practice of the systematic use of phytosanitary products in agriculture is justified exclusively by the economic benefit. The use of chemical insecticides should be limited to the imperative, and used when more efficient. 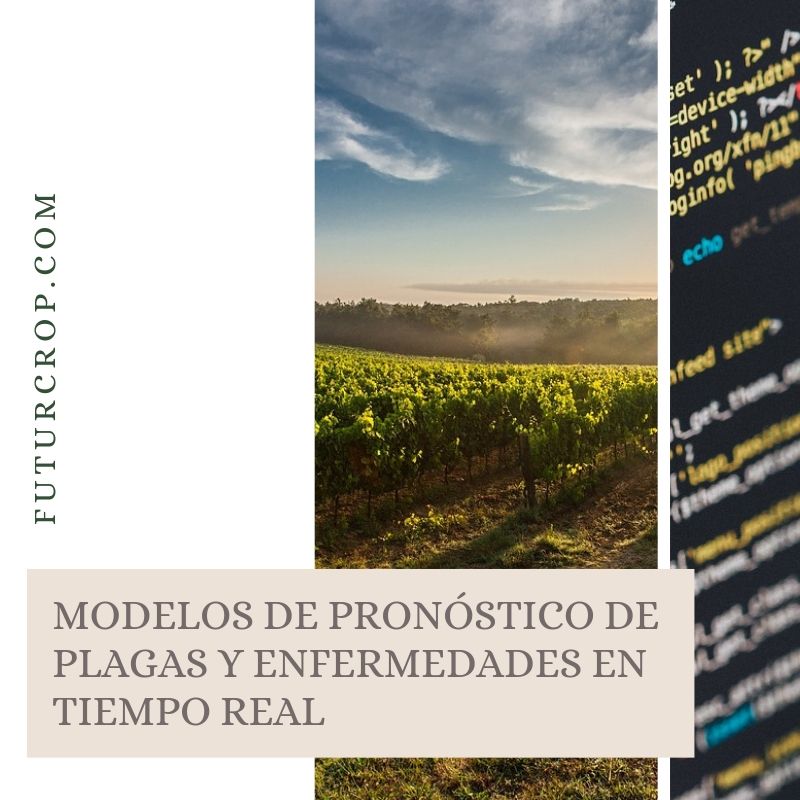 And for this it is necessary to have a knowledge of the biological development of the plague, through frequent (or automated) monitoring and predictive software of the population dynamics of pests, such as FuturCrop. Among the methods of combating the action of pests, it is increasingly common to use predators and parasites as alternative means to phytosanitary products. The pest biological control is usually understood as the introduction of the pests natural enemies (exotic in many times). But this type of biological control usually requires specialized technical assistance, knowledge of the state of biological development of the pest, and its success depends to a large extent on the appropriate climatological conditions for its release. The biological control of pests is also often an expensive resource compared to the application of insecticides. 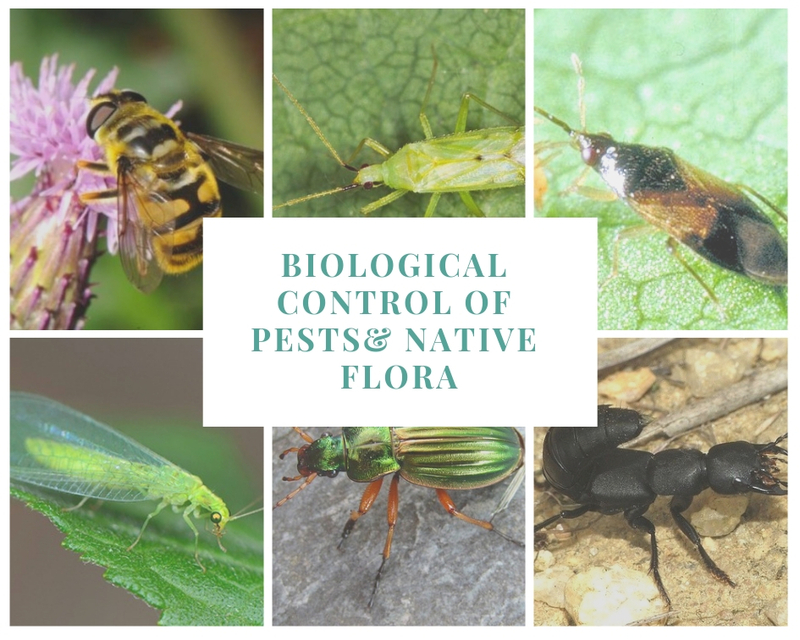 But the biological control of pests can also be promoted in a natural, conservative way, introducting of certain modifications in the agricultural environment, the habitats, which favor the presence of natural and native enemies of pests. For example, thorough the introduction or preservation of multi-specific hedges (at least 5 shrub species), in the agricultural environment, shrubs, foliage, vegetation cover, weeds that do not affect the crop, islands of vegetation, green corridors, margins of fields with wild flowers, etc. that allows establishing a reservoir of predatory or parasitic species of pests, ensuring their habitat and their food. In this way, increasing the diversity of natural enemies reduces the density of the pest populations. The management and conservation of semi-natural patches along the edges of roads, between plots, embankments and other unmanaged areas, helps to regulate phytophagous insect populations. Even weeds that do not interfere with the yield of the crop can provide food to insect populations throughout their life cycle, and are a fundamental support of animal biodiversity. It is important to control that the vegetable species for these habitats flourish sequentially, to provide food all year round (pollen or nectar) to the natural enemies of the pests, which are autochthonous vegetable species, and that non-species are host to viral diseases, which can be transmitted to crops. In the Mediterranean environment, for example, the escobizo or white bowl is a plant that can serve in this sense and, in addition, it is a plant that contributes to the fertilization of the soil.